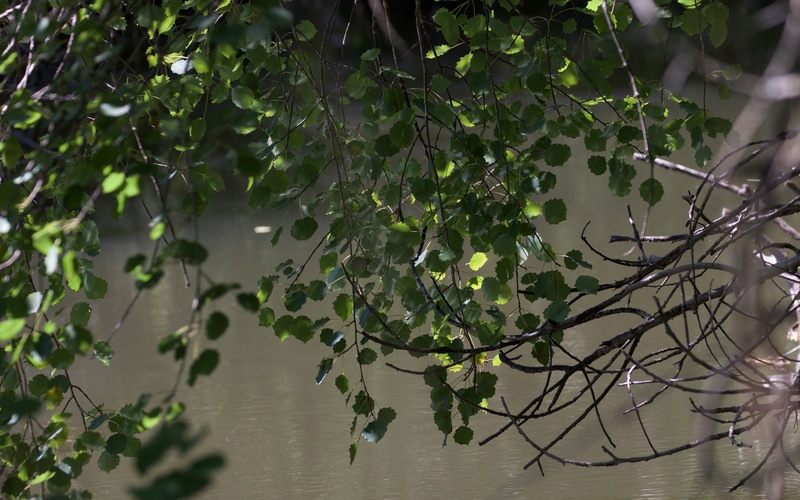 There is little to suggest that the habitats around the winding, river Lizonne near Vendoire on the borders of the Charente and Dordogne are in any way special. There is the occasional, brown-watered pond and impenetrable grassland amongst the ever present lines of willow and poplar. However, the alkaline fens of Les Tourbières de Vendoire form a thin seam of ecological gold, well hidden within the huge tapestry of agriculture and woodland that covers much of lowland France. The mosaic of springs, small sedges and carpets of brown moss species that form both peat and tufa deposits only occur where there is a rare combination of conditions: 1) the soils are permanently waterlogged; 2) the water supply is calcareous; 3) there are minimal fluctuations in the water level; and 4) there is a well developed peaty substrate. Flat valleys with slow flowing rivers within areas of limestone geology are not that rare but the big issue is that most of these squishy sites (rich fens and fen meadows) have been drained for agriculture throughout Western Europe. Even just a little drainage and the conditions change because the soils are no longer permanently waterlogged. Hence many former fens are now seasonally wet pastures, some of which are biologically interesting and valuable, others are fields of sunflower and maize. None contain the extraordinary range of rare species found in the fenland. The ponds in Les Tourbières have been created by peat-cutting for fuel (in English this was known as turbary). Unsurprisingly, Les Tourbières de Vendoire is now protected; it is part of of a larger protected area known as the La Vallée de la Nizonne (known locally as the River Lizonne). This is a ‘Natura 2000’ site, a specially protected area of European conservation importance. 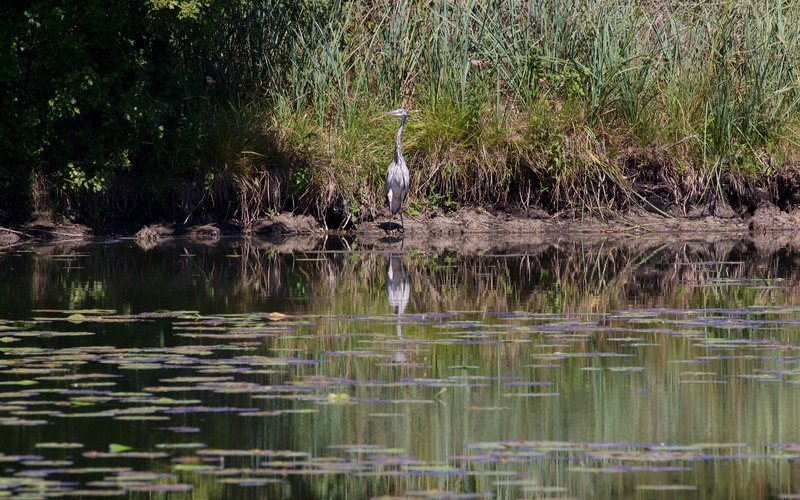 Details of all such sites and their so-called qualifying features (their rare and important habitats and species) are provided online by the Inventaire National du Patrimoine Naturel (INPN). The details for La Vallée de la Nizonne may be accessed here; it is comprised of remnant islands of fen and marsh habitat within the sinuous river valley that runs south from its source in the Charente through the northern Dordogne to the river Dronne. Perhaps more a broken string of pearls than a seam of gold. Aspen (Populus tremula) is present in the wet woodland. So what is so special about these impenetrable boggy places where mosquitoes breed and cattle flounder? There is a technical report on their management that says that the brown mosses are very sensitive to changes in water levels; put simply, if they dry out then they die. When they die peat stops forming and fens become meadows. In addition, there are a number of rare birds, butterflies, dragonflies, snails and plants that entirely depend on the special conditions created by the sedge and brown moss vegetation for their survival. Ecologists and naturalists count these species regularly; the data provide indicators of the quality of each remnant patch of fen habitat. 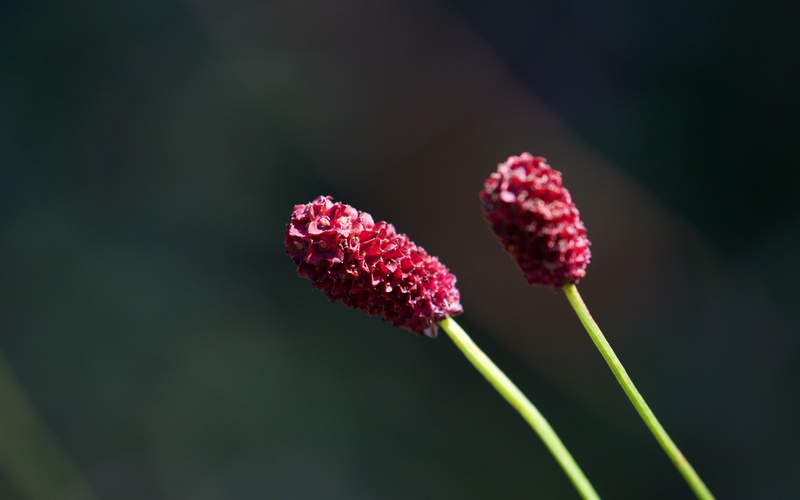 The red heads of Great Burnet (Sanguisorba officinalis); the plant is only found in wet fen habitats. Great Burnet is a funny looking plant but has an interesting story. The eggs of the scarce large blue butterfly (Phengaris teleius) are laid on them by the adults and the larvae feed on the flower heads for the first few weeks of their life (I wish I had looked more carefully at them) before being ‘adopted’ by particular ant species, spending the winter underground protected by the production of ant pheromones and eating their way through much of the brood of ants unharmed. So the butterfly requires both the plant and the ant species to be present and for the habitat not to be mown or cleared when the adults and caterpillars are above ground. It is not surprising that the butterfly which flies in July is so rare throughout Western Europe and declining in the East. The French name, L’Azuré de la Sanguisorbe, is perfect in its elegant description. There are a range of other very rare and beautiful butterflies, including the false ringlet (Coenonympha oedippus) and large copper (Lycaena dispar). The rare snails are tiny and known as whorled snails (Vertigo species), and plants include snake’s head fritillary (Fritillaria meleagris) and yellow meadow rue (Thalictrum flavum). 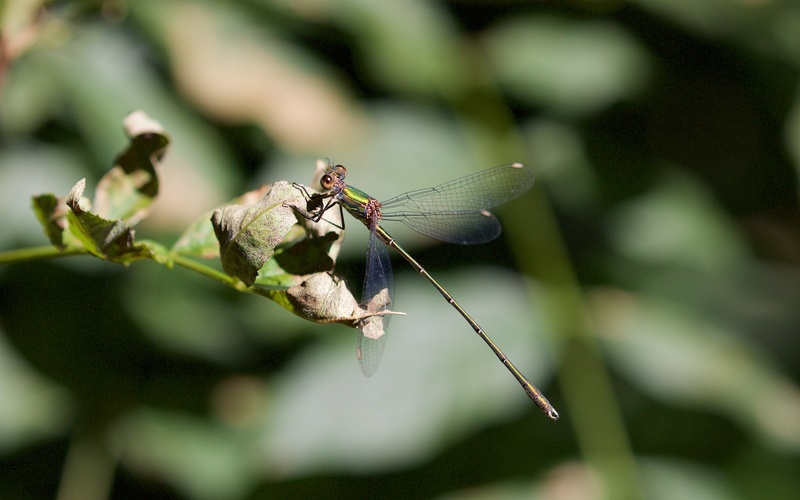 Of course all I managed was a futile struggle with dragonflies and damselflies; I think I only recorded some common ones, missing the orange-spotted emerald (Oxygastra curtisii) and other rarities. An emerald damselfly (Lestes sponsa); I don’t think it is the scarce emerald dragonlfy (Lestes dryas) since it has such a slender abdomen. 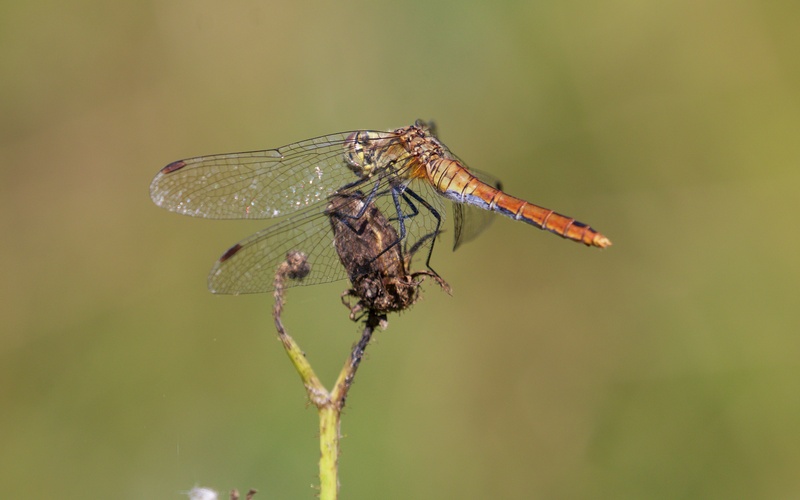 I think this is a female keeled skimmer (Orthetrum coerulescens). Waterlogging and the maintenance of exceptional water quality are the key measures to keep these wonderful mires in rude health. The huge raised mires of Cors Caron National Nature Reserve in West Wales have been rejuvenated by the creation of long shallow bunds or earthen banks to hold water back and hence allow old peat cuttings and dried out areas of vegetation to be waterlogged once more. Could such similar bunds in places where fen has been lost along the Nizonne and elsewhere do the same? Whatever the long term conservation plans are for this quiet and unassuming valley, full of hidden riches with unassailable Latin names, I do know that Les Tourbières de Vendoire and neighbouring fens along the Lizonne river have to be visited again in Spring and Summer to try to see some of its array of rare species, especially the wonderful L’Azuré de la Sanguisorbe. Tomorrow I am going to look for the LPE. It’s much cooler after big storm last night. Thanks Jan, yesterday I had four hours on a slow boat across the channel to scribble away. Meadow brown and small heath sound right. There ought to be a comma about too. Blue could well be Provencal short-tailed which I reckoned was very common – look for rather plain whitish underside and a little tail at base. Good luck with the LPE (and look for Map butterfly there too).